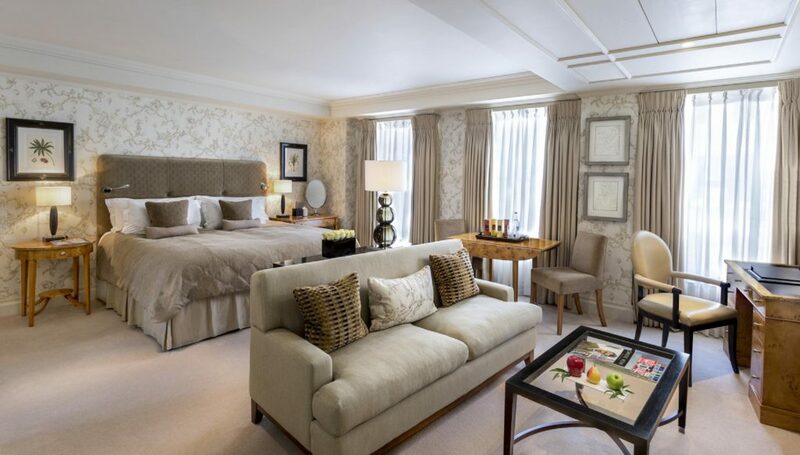 Tucked away at the end of St James’s Place, The Stafford London really is a hidden gem. Those in the know can access it via a dark alleyway from the lush expanse of Green Park, but its location puts it within strolling distance of the West End and London’s most important tourist destinations. 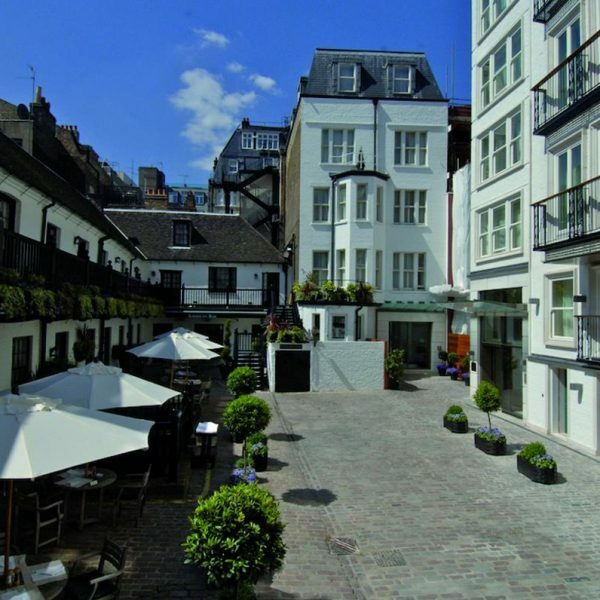 Full of classic British charm, The Stafford London has furnishings and decor that would not look out of place in the country homes of Britain’s aristocracy, while the little mews courtyard at the rear is reminiscent of the piazzas of Italy, not least because dining is available at the little tables outside and a few knots of chatting guests are usually in attendance. In the main house, a former residence of Lord and Lady Lyttelton, has a range of rooms and suites that draw on the Victorian heritage of the property, while further guest rooms are available around the courtyard in the Carriage House, the Mews Suites, where there is also a penthouse suite with private terrace, and the Gatehouse. We were given a junior suite in the Mews building, which was decorated in natural soft beige and had a lovely view onto the courtyard and a small balcony, although the doors to this were locked. The bathroom featured two standalone sinks, a bath and very satisfying rain shower. 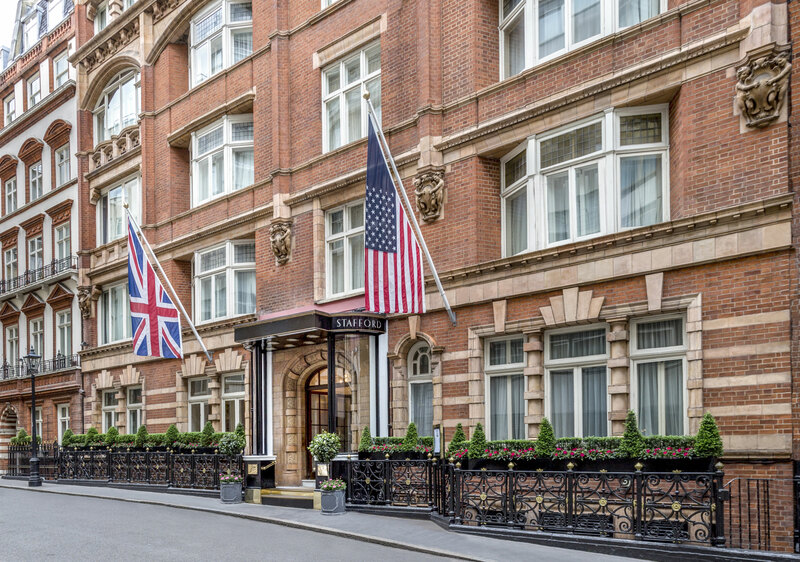 A gym for residents is also located in the Mews building making this an ideal location for a longer stay and breakfasts, served in the American Bar, The Game Bird, or in your room, are quite delicious. 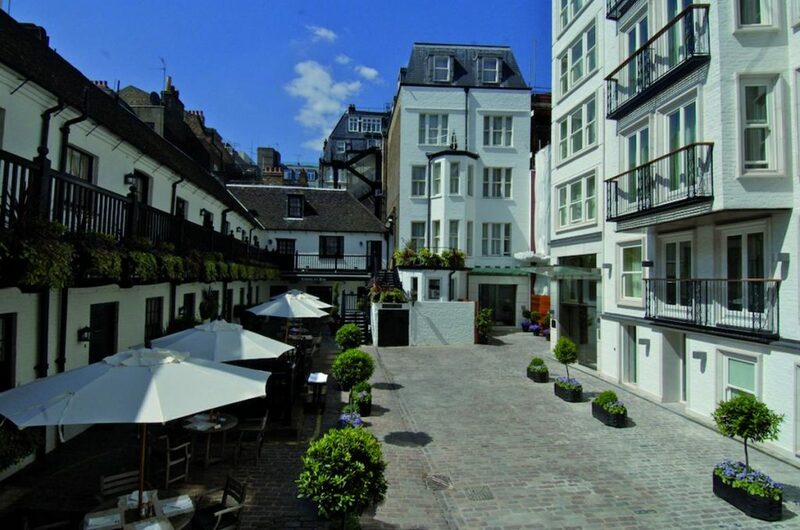 The Mews building has the feel of a residential area rather than a hotel; the building is accessible without passing through the main house, so it would be very easy to slope in after a night on the town. 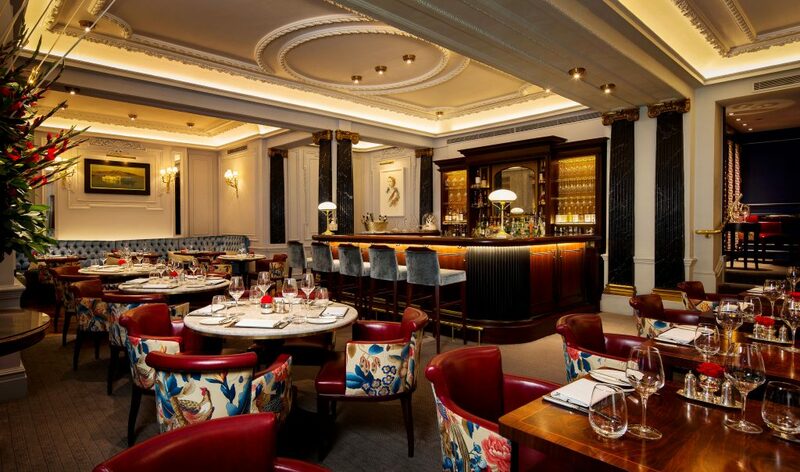 The Stafford London, however, has the cocktail crew catered for too. 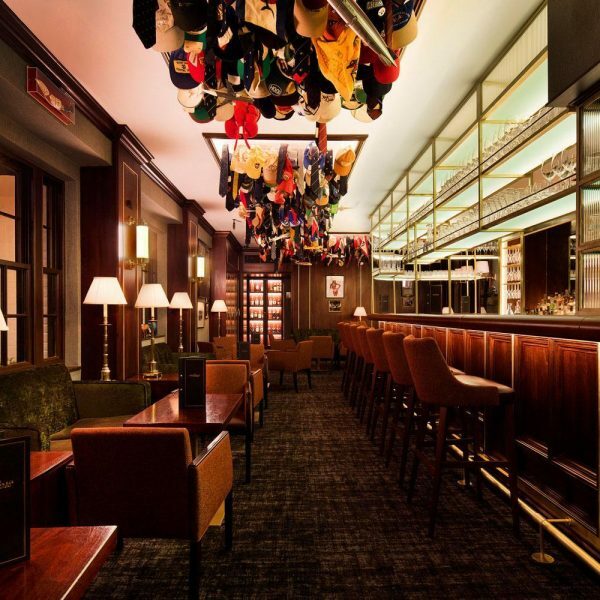 The American Bar, festooned with brightly coloured flags and caps, offers n intriguing menu. Some of our favourites were the ones inspired by London’s rich history and bar manager Andrea displayed an extensive knowledge of the beverages on offer, as well as their stories. The Moriarty, named for Sherlock Holmes’s nemesis, was a warming treat, based on the smokiness of Vida mescal – a spirit championed by expert bartender Salvatore. Another favourite was the White Mouse, a light champagne and egg white cocktail set of by a measure of saffron gin, sharing its name with the codename of WWII heroine Nancy Wake. Salvatore also showed us the show-stopping Oppenheimer – inspired by the blue diamond of the same name which sold at Christies in 2016 for more than £57m. The cocktail is a bright electric blue, served in a diamond shaped glass on a rotating plinth that lights the drink from beneath to show off its colour. 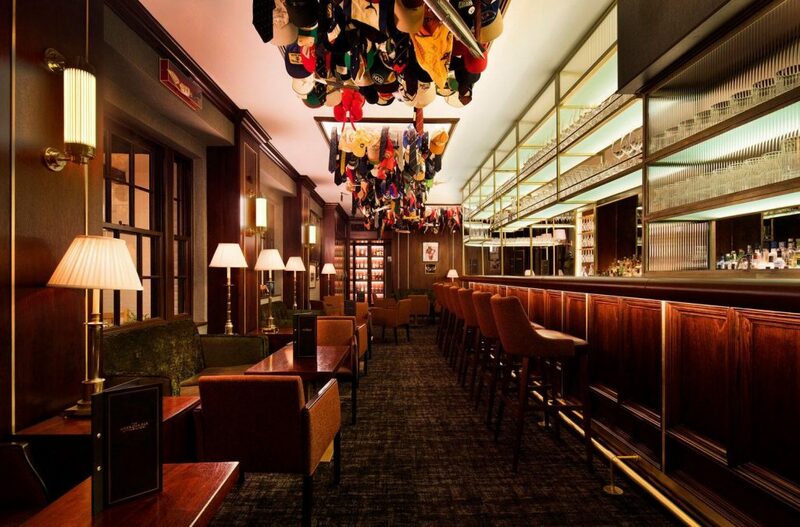 Some real experimentation with the classics is occurring here; for those who love to discuss cocktails with like-minded enthusiasts, nothing could be better than an evening at the American Bar. The WWII connections go deeper than cocktails named after famous historical figures… Beneath the Stafford London’s main house lie a network of tunnels build in the 17th century that were used during wartime and now house the wine collection. You can take a candlelight tour of the wine cellar with master sommelier Gino Nardella; you’ll see some very valuable bottles and receive a history lesson as you pass by some displays that recall the history of the location. 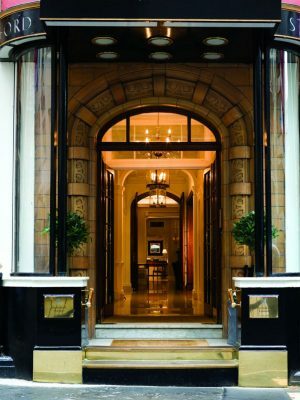 Passing back to the ground level brings you to the entrance of the hotel’s restaurant, The Game Bird, which continues the quintessentially British spirit of the property. The Game Bird prides itself on using the finest seasonal ingredients from local artisanal producers. 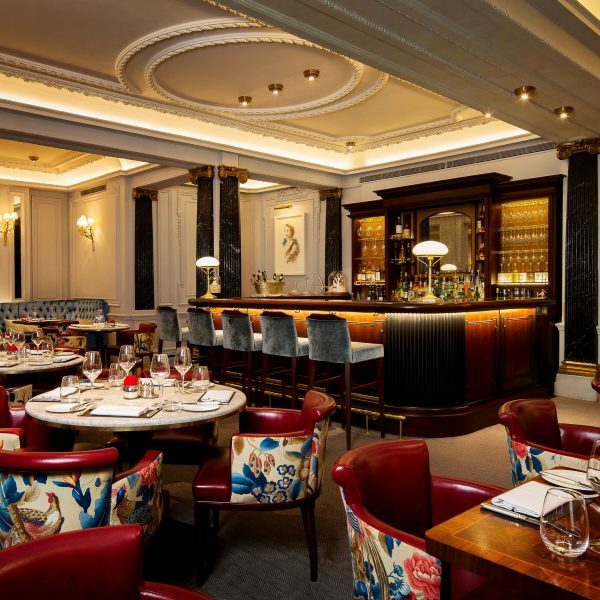 Promising a ‘theatre of the senses’, the menu features British classics and modern twists in a relaxed setting of comfortable club chairs and elegant banquette in neutral colours, arranged around a small champagne bar. Waiter Alpay and sommelier Giorgio were very informative about our menu and wine choices – to the point that I completely changed my planned appetiser on a whim after hearing about the in-house Balvenie whisky smoked salmon. This arrived to the table on a trolley and I was able to select from garnishes such as egg yolk or white, horseradish crème fraiche, and cucumber and dill pickle. The salmon was well-flavoured, but not overpowered by the process and the fresh and well balanced Chablis Premier Cru “Vaillons” 2016 wine from Simonnet-Febvre that accompanied. The same wine was a good pairing for Charlotte’s chicken and duck liver parfait – a light mousse with rich irony flavour, served with an interestingly perfumed pear chutney and toasted brioche. Continuing with the winged theme, Charlotte continues with the signature dish ‘The Game Bird’, comprising roast pigeon, braised leg, cabbage, parsnip and “Bullshot”, which turned out to be a twist on the warming drink favoured by shooting parties in autumn. My main course was another game disch, this time venison, served beautifully rare with a savoury dark chocolate sauce, pommes puree, mushrooms and blackberries. Embracing the coming autumn, this was an excellent dish for a chilly night, with just the right combination of substance and finesse. We, as ever, insisted upon a cheese interlude and were able to choose from a trolley – an increasingly rare treat, even in the finest of restaurants – a red Leicester, a cheddar and my new favourite, a rich and creamy Tunworth. In this most British of establishments, a 20 year aged Graham’s tawny port was served alongside the cheese; I began to put the last nostalgia for summer well and truly behind me as I was reminded of the delicious warm spirits and delectable dining that winter brings. Even the ‘Pudding Menu’ has an irrepressible Britishness to it and it even features a classic syrup sponge pudding. I opted for the dark chocolate mousse, which had a decadent density to it, while Charlotte selected the salted caramel soufflé – she was impressed by the way in which the salt came through the sweetness. A Moscato d’Asti ‘Moncucco’ and Capricho do Camilo Castilla muscatel were the wine choices, a sweet Italian end to a hearty British dinner. Having London on one’s doorstep, yet still the feeling of being in one’s own place of residence, is the ideal situation for exploring the city over the course of a couple of days. 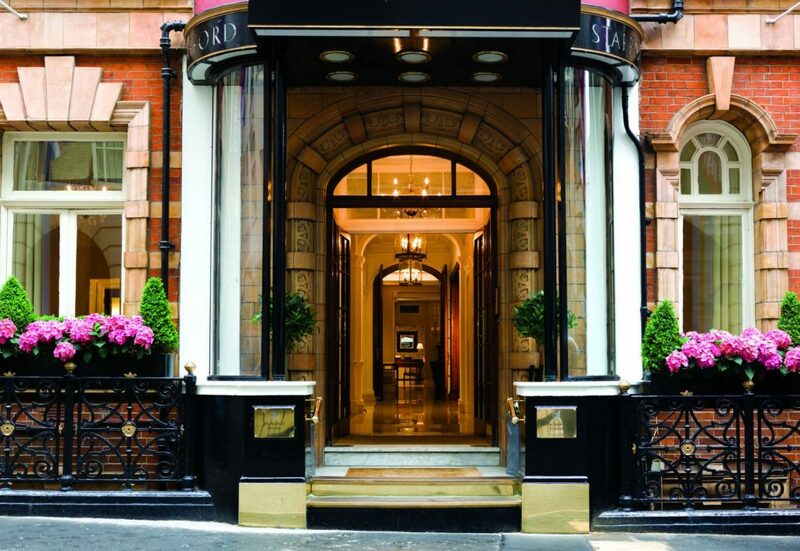 The Stafford London Hotel is traditional establishment which has found ways to combine the aspects of Britishness adored by tourists with some modern flair. 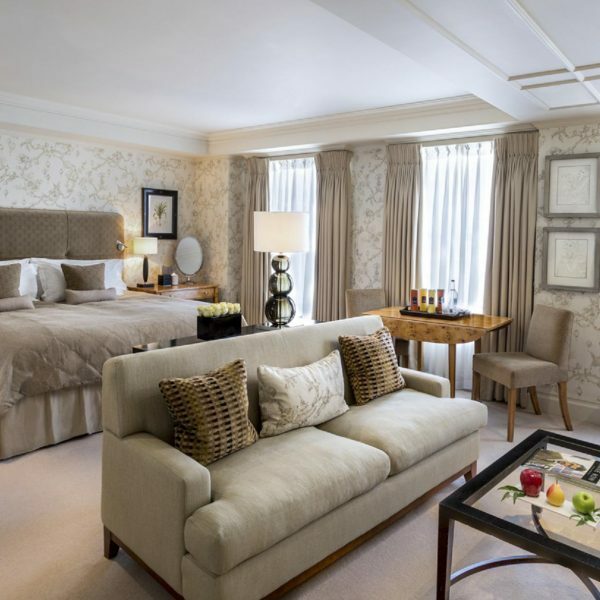 This creates the Holy Grail of London hospitality, combining the grandness of a city townhouse in a fabulously convenient location with the comfort of a cosy chair by the fire a country hunting lodge. Like one of Salvatore’s cocktails, The Stafford London Hotel has found the perfect blend.